Ukulele jam on second Tuesday of every month 7.30pm till 9.30pm in Shoreham-by-Sea. Mini Jam on the fourth Tuesday of each month. Beginners welcome. 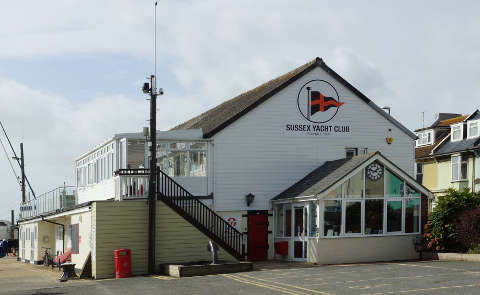 Main Ukulele jam on the second Tuesday of every month 7.30pm till 9.30pm at the Sussex Yacht Club, Shoreham-by-Sea. Mini Jam on the fourth Tuesday of each month 7.30pm till 9.30pm. Beginners welcome at both jams. We started off as Uke at the Duke in January 2011 in response to a request to run an evening jam. The Worthing jam known as Wukulele (which has now become Lancing Ukulele Village Club) was our model and we remain close to our sister jam which is a Sunday lunchtime event. Many ukulele players attend both jams. In 2018 we became Quayside Ukes. Quayside Ukes has its own songbooks and invites players to submit their favourites for inclusion, songs range from traditional to punk classics, there are even a few originals. The jam meets at “The Sussex Yacht Club”, 85/89 Brighton Road, Shoreham-by-Sea, BN43 6RF on the second Tuesday of each month 7.30pm till 9.30pm. There is a mini jam on the fourth Tuesday of each month at the same time and venue. Occasional away fixtures are played in local venues and the jam organises its own festival in September of each year at The Ropetackle Arts Centre. Many groups have formed out of the jam. Jams are led by many players and are an independent non-profit collective. There is no charge for attending our jams and no formalities, just turn up and play with us. Tuesday 8th January 2019 at 7.30pm in The Sussex Yacht Club, Brighton Road, Shoreham-by-Sea. We will be using books 14, 15 and 16. It's that time of year again. We're going to have a bigger Christmas Jam than ever. We'll be using books 4, 13 and of course the Christmas Songs book. You can download all these books from this website. We will be also projecting the songs again this time but on the ceiling!! There will be crackers, party poppers, mince pies and plenty more for an evening of festive fun. Do come along and help make it a real hum dinga of a party. If you belong to another jam, why not come as a group. We've got plenty of room and who knows you could come and do a turn if you like? Starts at 7.30pm at the Sussex Yacht Club but arrive early to get a good seat and don't forget to wear that festive jumper and hat. If you download Volume 2 now you will get the updated version. None of the songs have changed, so if you already have a printed copy that you're happy with you don't need to print it again. In the old file the pages were not all set to A4 and this has apparently caused some problems when printing. In the new file all the pages are A4. If you keep a copy of this file on your computer or tablet etc it is recommended that you replace this with the new version. How do you know if you have the new version? Open the file using Adobe Reader. From the File menu select 'Properties...' A new box will open, make sure the 'Description' tab at the top is selected. Look further down on the left and you should see 'Modified: 27/11/18 16:55:49'.